I’m starting to lose my hair. Can I book a consultation – and what’s involved? Of course! There is a broad range of solutions available for hair loss, and it is imperative to obtain professional advice before starting a treatment. During a consultation at Meshkati, a specialist will examine your hair and scalp to advise you on the best available solution. Do you offer specific treatments to prevent further hair loss? Yes, we have two personalised preventive treatments available: a Botanical Hair and Scalp Rejuvenation and a Therapeutic Anti Hair Loss Treatment. They are both made exclusively from organic botanicals, which nourish and strengthen the hair roots and follicles, and include a serum formulated for your specific hair concern during the first session. The Therapeutic Anti Hair Loss Treatment also includes a Meso-infusion of polyvitamins, amino-acids and minerals, and both treatments finish with LLLT-LED light therapy – a biophotonic light with highly regenerative properties. We see extremely positive results with these treatments and contrary to chemical solutions, they have no side effect. Tell us about the non-surgical procedures available from Meshkati, and their benefits? Our exclusive Nanoprocedure is entirely non-surgical and allows us to restore a full head of hair regardless of the extent of hair loss whilst maintaining the health and integrity of your existing hair. Using a detailed hair analysis called DNA-Matched, several samples of your hair are taken to assess physiological and chemical parameters such as texture, thickness, colour, waviness, etc. On the basis of this assessment, natural donor hair is selected to match your own from the Meshkati Hair Bank. The procedure takes around 20 hours, spread over three or four consecutive days, and you leave with the finished result: there are no side effects or recovery time. Depending on the extent of hair loss and the client’s desired result, we offer both Follicular Unit Extraction (FUE) and Permanent Bridgepoint. FUE corrects limited sparse areas by extracting units of follicles from a region of dense hair growth, typically at the back or on the sides, and implanting them into the desired area where they will grow. Permanent Bridgepoint goes further by adding additional hair, with no limit to the density that can be achieved, and with results that are visible immediately after the procedure. Both FUE and Permanent Bridgepoint are minimally invasive and carried out under local anaesthesia. Is it true Meshkati has its own laboratory? Absolutely! Meshkati is not just a hair centre, it is a laboratory focused on hair innovation. Our story is rooted in research. We have developed unique procedures such as Nanoprocedure, Permanent Bridgepoint and Chemosoft. Most recently, we have developed a range of preventive treatments that slow down hair loss and which we now offer in our centre. How did Meshkati come about? I have worked in hair research and hair reconstitution for 32 years now. 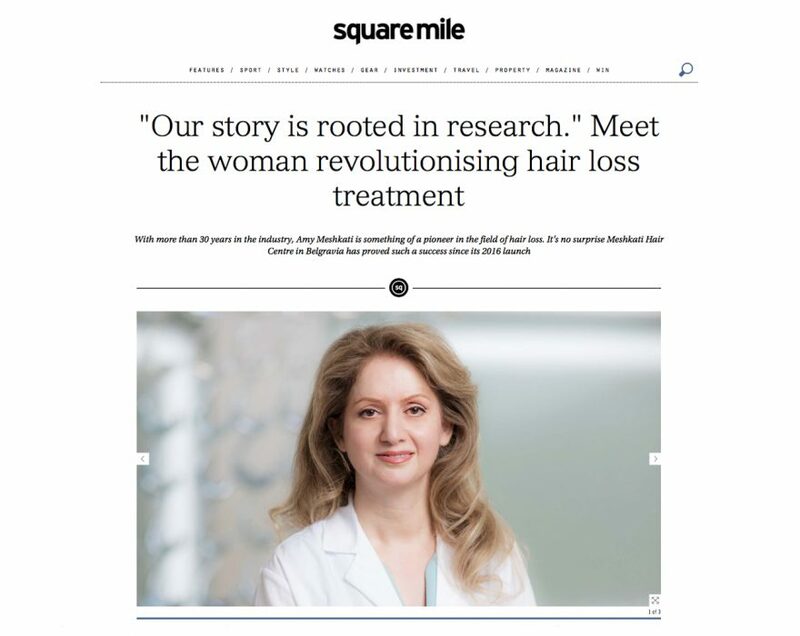 Creating beautiful hair has been my lifelong mission ever since researching teenage alopecia at university in France and witnessing the emotional devastation it can carry. We had long planned to open a London clinic. London is one of the world’s most cosmopolitan cities, and a preferred hub for our international clientele. With direct access to our clinic in a townhouse on Grosvenor Place, privacy is ensured at all times.